For decades taxpayers have paid billions to finance major transportation project cost overruns far exceeding the routinely low-ball forecasts available at approval time. This has been documented in a wide body of academic literature, the most important of which was conducted by Bent Flyvbjerg of Oxford University, Nils Bruzelius University of Stockholm and Werner Rothengatter of the University of Karlsruhe in Germany (Megaprojects and Risk: An Anatomy of Ambition). Exaggeration #1: Job Creation: The Central Florida Partnership claims that Sunrail will create 10,000 jobs. "almost immediately." This would be quite an accomplishment. The Sunrail project is currently projected to cost approximately $850 million for just the first segment. Every cent of the likely cost overruns will be on a blank check drawn the account of Florida taxpayers. At Sunrail's claimed rate of job creation, the Obama Administration's $800 million "shovel ready" stimulus program (enacted in 2009), would have "almost immediately" produced more than nine million jobs. By now, the unemployment rate would have been reduced to little above 2 percent, lower than at any point in the more than 60 years of available data. Of course, and predictably, the stimulus program did no such thing, not least because a job created by public spending is likely to destroy more than one sustainable job in the private sector. 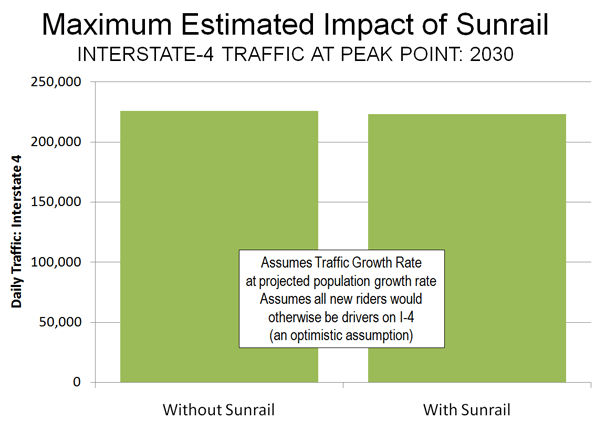 Exaggeration #2: Sunrail Will Make a Difference: The proponents imply that Sunrail will carry a significant number of trips in the Orlando area, claiming that the line will carry one lane of freeway traffic and that it will give central Florida residents an alternative to high gasoline prices. In fact, even if Sun Rail reaches its ridership projections, it would take a full day of train travel to remove less than an hour's peak hour freeway volume. Needless to say, no one will notice any fewer cars on the freeway (Figure). Further, Sunrail will not provide an alternative to the overwhelming majority of central Floridians, since it will attract only 1,850 new round-trip riders per day by 2030 (Sunrail's number). Spending $850 million on Sunrail is the same as the taxpayers giving each new rider a gift of $450,000. The Need to Set Rational Priorities: All of this is occurring in the face of an national fiscal crisis so severe that even the AARP has expressed its willingness to consider cuts to Social Security. As an AARP spokesperson put it "You have to look at all the tradeoffs." Indeed. Submitted by ymouel on Mon, 05/25/2015 - 08:33. Submitted by VickiHuter on Thu, 05/14/2015 - 02:04. Submitted by david watson on Fri, 05/08/2015 - 04:51. Submitted by johnz308 on Sat, 05/02/2015 - 13:45. Submitted by johnb6174 on Fri, 05/08/2015 - 16:02. Submitted by albela on Thu, 04/16/2015 - 22:54. Submitted by arrharish250 on Sat, 05/23/2015 - 08:40. Submitted by xahgzr1122 on Sun, 04/12/2015 - 08:22. Submitted by johnz308 on Fri, 04/10/2015 - 00:25. Submitted by xijozx1122 on Tue, 03/03/2015 - 05:26.